Good Morning Macau! I just rolled out of bed... an extremely *firm* bed at that. I was up late taking pics from my hotel room and chatting with Mrs. Mo back home. Evidently our dog, who hasn't eaten since I left, finally ate something... she misses me so much she can't eat - ain't that sweet. So today I'm checking into Hotel Lisboa and meeting the MGM people in the Wynn lobby at 3pm. I have a hunch that maybe they tipped off StarWorld to give me the VIP treatment. We'll see if the StarWorld VIP thing is an isolated incident or if the word is out that a website that hasn't officially launched yet is in town to do reviews. After the MGM meeting, I'm probably going to head back to the hotel to do some 'real writing.' I'm worried that after a week of running around some of the details of what I've experienced might go AWOL. At the very least I'm going to store as many details about the StarWorld experience as I can... then hit the Lisboa and Grand Lisboa's casinos. In case you were wondering, I made a conscious decision to hold off on visiting Wynn Macau until I check in there on Sunday. 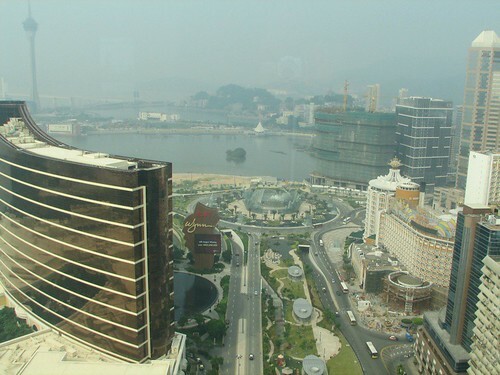 I'd like to have a fresh view when Wynn Macau gets its close up. I'm dying to have a cup of their excellent coffee though. We'll see if I can hold off for two more days ;(. Sorry but my first attempt to post seems to have gotten cut off. My question was now that you have stayed in 5 and 6 star hotels like the Crown Macau, Wynn Macau and StarWorld, how are you ever going to be able to stay in dumps like the Bellagio, Mandalay Bay, Venetian, and MGM Grand? (just kidding)But really how do the Macau hotels compare to the standard Vegas strip hotels? Are the room rates about the same, higher or lower than an average room in Vegas? What are the food prices likes? Excluding destination travel costs, which is a better value, Vegas or Macau?What is the gambling like there? Are there any games, other than Craps and Poker, that they don't have? (like the Big Wheel) Do they have any games that aren't in Vegas? Are their slot machines all ticket-in ticket-out or any of them traditional coin in and out? Does Macau have gambling on Pachinko machines?